The number of medications used to manage Juvenile Myositis and its side effects can be overwhelming. 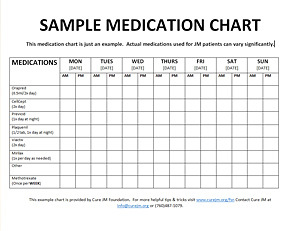 To help you stay organized, Cure JM has developed this sample Medication Chart. It's in Microsoft Word format, so you can customize it to fit your specific needs.